Here’s the solution for Samsung Galaxy Star Pro S7262 for Insert sim card problem or the phone won’t recognize or detect any sim card inserted to it. We track down the simcard pin connection as showed on the image below. We can use it for an ease of troubleshooting, if the insert sim card error problem occurred on the device. SIM power line might be faulty, if it happens then it doesn’t show SIM card. It might be due to faulty capacitors. They are total 4 in numbers, if any one of them is faulty then it will affect your overall SIM card function. Such damage should not we take it to the phone repairman. but with the notes you have equipment like tester tools, solder and tin, screwdriver, and refined to make a jumper cable. Check the voltage on the line as shown above and make sure everything produce voltage. If the four lines has produced a voltage then please try to insert sim card and turn on the mobile phone. 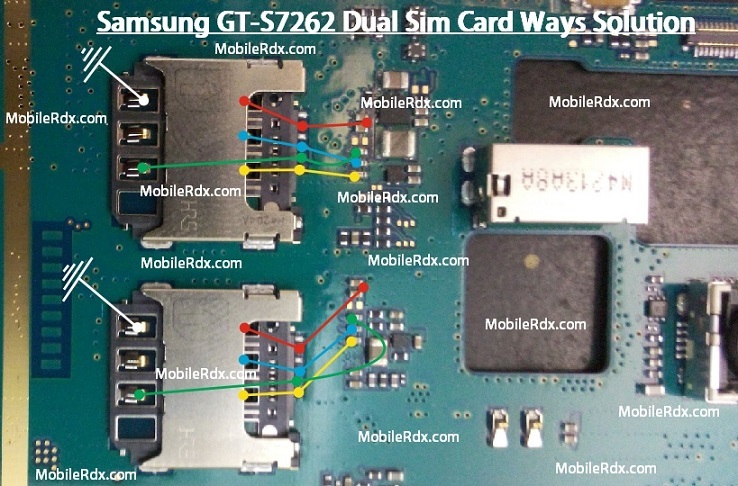 Samsung S7262 Sim Card Jumper,Insert Sim Solution,Simcard problem Repair,Sim Card Ways,Sim Not Working Solution,Sim Card 2 Ways,Sim Ic Jumper,Sim Not Accept.